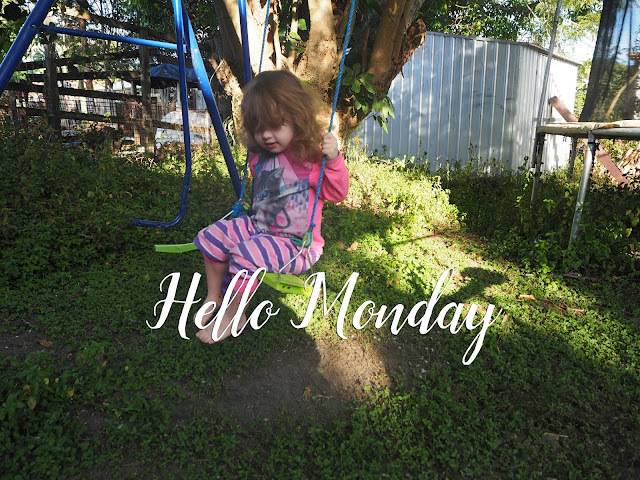 hello early morning swings The cooler weather means we're utilising the backyard more. It's still a work in progress, but we try to get out there early in the morning on non-daycare days. hello emotion hangover I had no idea that was even a real term until I did a bit of googling. But it's safe to say that no one is enjoying teenager-hood at the moment. And while I've tried to deal with it myself, we're at the stage where no one feels safe in their own home any more, and that's an issue. hello illness The winter lurgies have started, with me. I seem to get sick every May, or at least every other year. And Steve and I laugh about it every time, because I was sick when I met it. hello goals I've made crappy progress with my goals for this month. But I'm going to take some time this week to look at them again, and see what I can actually finish before the month is up. I didn't realise you guys had a swing set in the backyard, lucky ducks! I wish we had the space for one here. Yep, hello lurgies for me. I'm sick and sniffling and bleurrgghh. We used to have swings but they went to swing heaven. We just have a trampoline, but none of us are morning people,so we're too zombie-like in the mornings to use it. Good luck with those goals. I can relate to the emotion hangover. Really hope things improve for you soon. I've been back working in daycare so hello being sick. I hope things get better on the teenager front soon. Enjoy the cooler mornings and outside time.